I almost forgot… | Food It Yourself! So a few weeks ago I shared my rat’s tail radish problem with you. 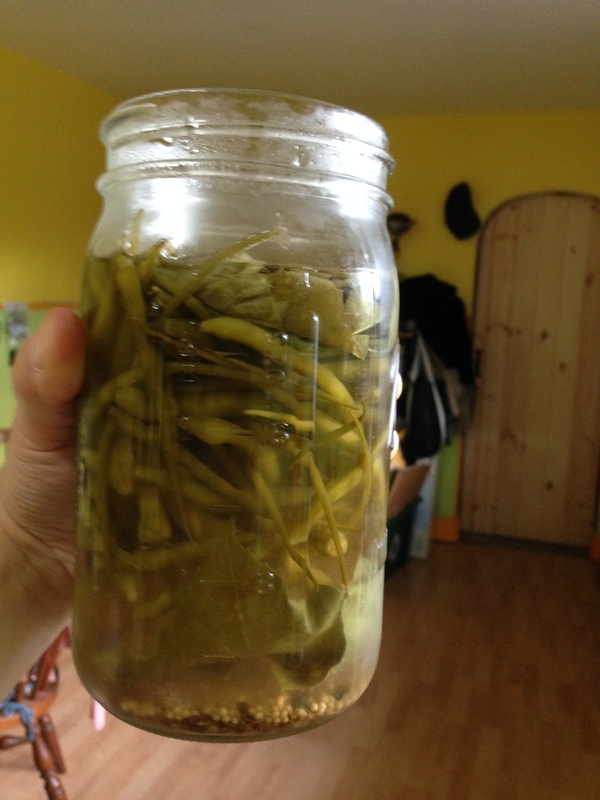 Those crazy pickles are now fully fermented. Here are before (left) and after (right) shots of those radishy rascals. They took a good long while to get fermenting. They were not the least bit tart for a good ten days. Once the lactobacillus got going, though, they turned pleasantly sour in just a few days. Over all, I had them fermenting for just about two weeks. I am actually wondering if my fear of inviting the wrong kind of microbes to my pickle party worked against me here. I scalded the jar (filled with boiling water and capped loosely) just before filling it. I wonder if the long fermentation time was due to the jar actually being “too clean”. I am still trying to get a hang of this fermented pickle thing. I’ll just have to keep trying. The pods themselves lost their radish bite during the fermentation. The texture reminds me of string beans, and the dill and mustard seeds seasoned them delightfully. I absolutely enjoy them. Mr. Food It Yourself was far less impressed with the results, which means I don not have to share with him. 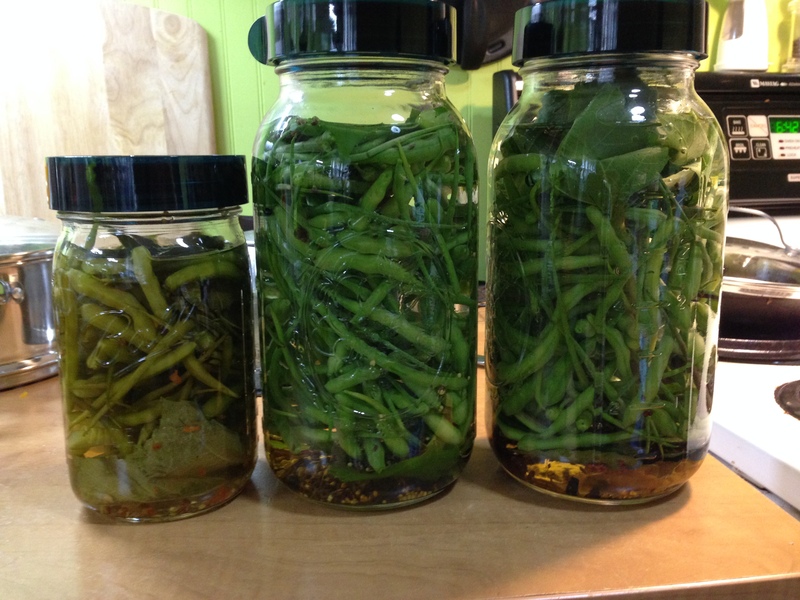 That’s one more quart jar and two half gallon jars full of brine-cured pods. I seasoned each batch a little bit differently. So far, my favorite is the second quart, which I seasoned with chili pepper, ginger, and garlic. All of them are quite tasty, though. I may not ever grow rat’s tail radish pods again. 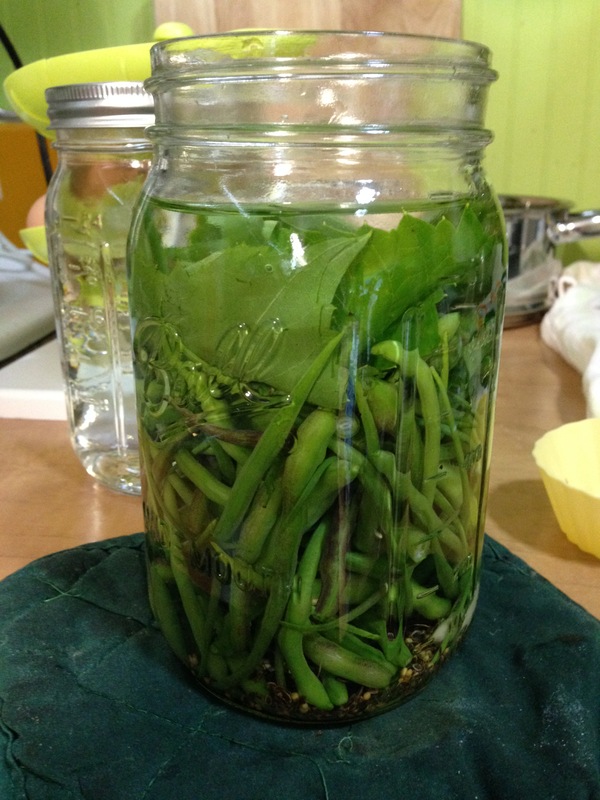 However, I will enjoy the ones I harvested and I will continue to play around with fermented vegetables. What’s the best “save” you ever made in the garden or in the kitchen? Share in the comments! ONE MORE THING! I promised I would look up the rationale for adding grape leaves to pickles. The food preservation pages of the Penn State Agricultural Extension had the answer I was looking for. Some vegetables contain an enzyme called pectinase which causes softening after harvest. Tannins, bitter compounds found naturally in plants, can stop the action of the pectinase. Grape leaves contain tannin, and thus they keep your pickles crispy. How cool are Agricultural Extension services? Very cool. Because now we all know that.